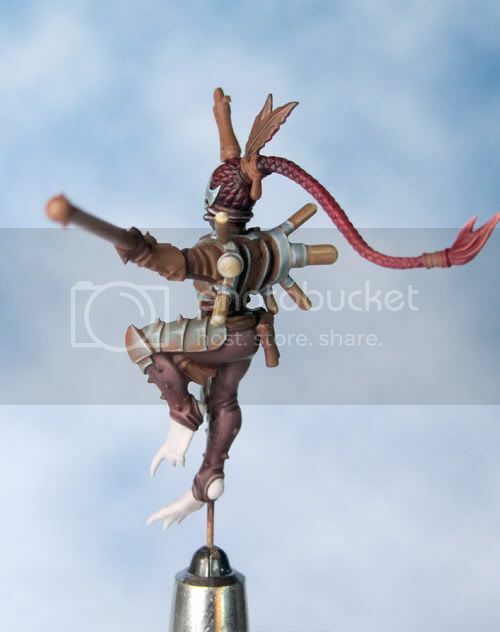 The method described bellow is the one I’ve used to add the drips of poison to my Hellion’s whip. There are many variations on the method and materials that can be used so this is very much my own take on things. In order to get a nice long drip with a curve to it and a blob at the end their needs to be some kind of support/armature onto which the drip can be built. In theory you can build up the effect without one but it would take a lot more time and the final result might be quite fragile. For my drips I used a hair to provide that support. There are other materials that could be used, for example very fine fishing line, but a hair is easy to get hold of and it’s a renewable resource. Tragically it just so happens that I now have a few white hairs in my beard so these were the obvious choice. Glue the hairs in place. This is the really fiddly bit. On my Hellion I used clear glue and for the example here I’ve used super glue. On both the hairs had a tendency to shift position as the surface tension of the glue pulled them out of place. Use as little glue as possible and apply it with something fine like a pin. Let the glue get completely dry before you move onto the next stage. Now you can start to build up the drips. To get things started off I’ve used clear glue. Squeeze a little out onto a piece of scrap paper and leave it to begin drying. Once it has started to thicken up it will be easier to get a blob to form on the hair. What you are aiming for if a coating of glue on the shaft of the hair and a little blob about to drip off the end. Apply the glue with a pin and once again leave it to dry. If possible support the model in a position that helps the blob of glue to dry on the very end of the hair.... get gravity to do the work for you. This bit takes time, as the drip needs to be built up with multiple coatings. It is best to let each coating dry thoroughly before applying the next. They tend to shrink a little as they dry and if you rush thing you will have less control over the final result. For my drips I’ve used Games Workshop’s water effects tinted with a tiny dot of green paint. I’ve applied this with a fine brush giving each drip an even coat and then applying it more thickly where I want volume. As with the glue it is easier to get the thicker areas to build it if you let the water affects begin to set just a bit before you apply it. Keep on building up the drips with successive coatings until you are happy with the result. As well as forming a blob on the end build up some thicker areas and a few small blobs and drips at the base. If you don’t need your drips to be clear or translucent you could build them up with successive coats of paint alternatively you could use PVA woodworking glue. 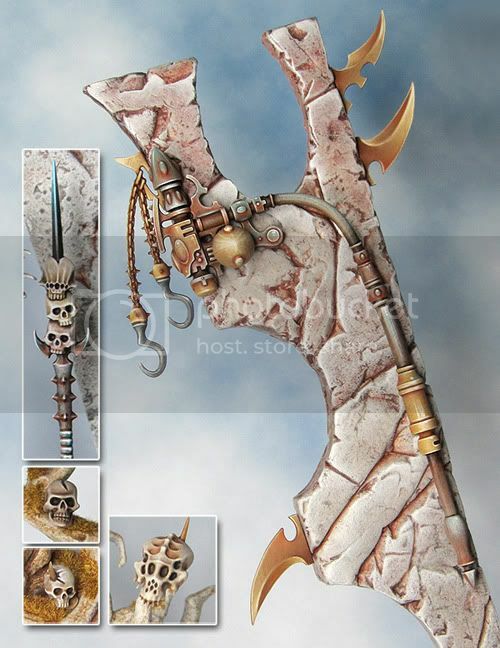 This is what I used to create the slime on my Nurgle Predator. 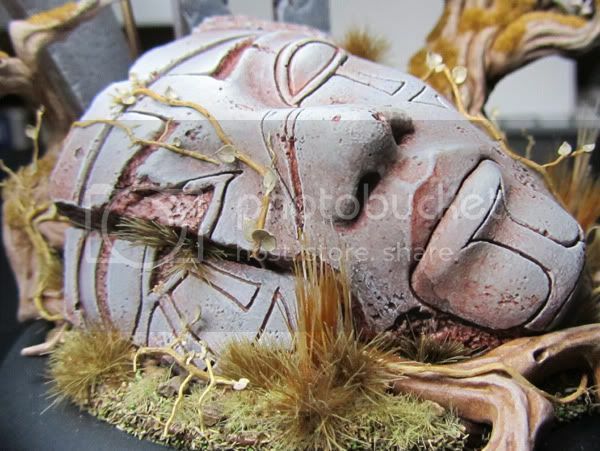 I’ve also experimented with using Araldite Rapid epoxy glue but this needs to be done with extra care, as it’s hard to control and very permanent once set. 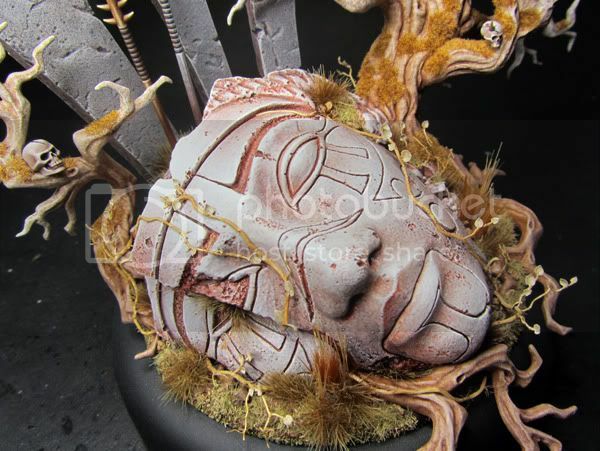 The guys over at massive voodoo are a huge source of inspiration and ideas. The following articles were particularly useful to me with regards to finding out how to create drips and slime. I've been spending a little time sprucing up the look of the blog but painting wise there's not too much to show for the last two weeks. Never the less it's time for an update so here is a nice big picture of the Scourge as it currently stands. 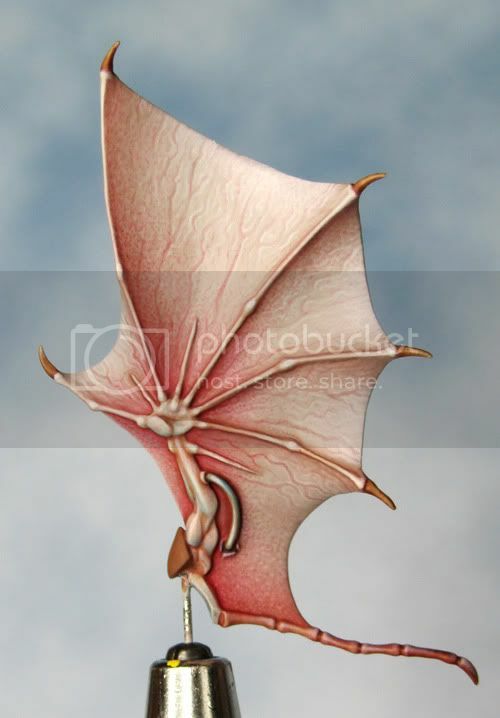 I've been asked to create tutorials on some of the techniques I've used so look out for a slime and drips step-by-step in the coming week followed up by an illustrated to guide to how I am painting the scourge's wings. I took a slight diversion from the diorama project this weekend and spent a little more time experimenting with plant roots & paper leaves. I had an unfinished Dryad on the work bench from ages back that I just ran out of steam on so I thought it might be fun to try and make something of it. The paint job is still on the rough side but I think the overall effect shows promise. I intended the diorama to feature two gangs of warring hellions. 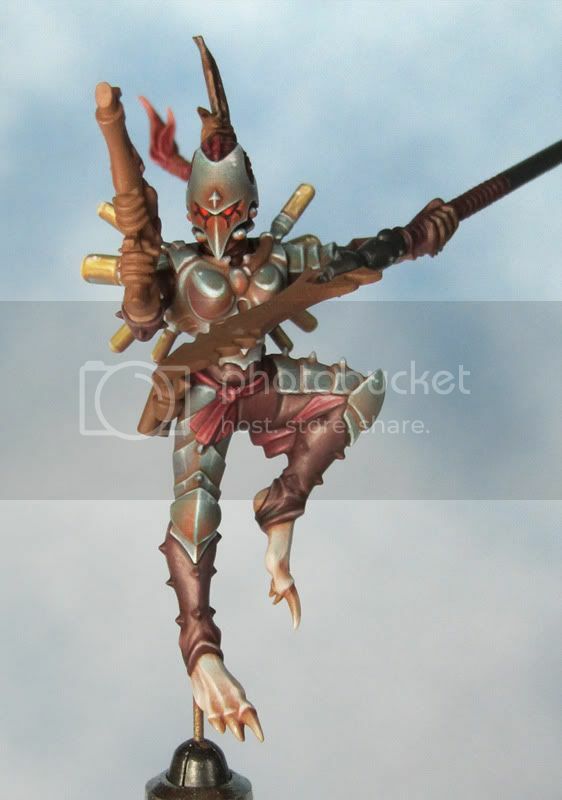 Then I clapped eyes on the new Scouge figures...it was love at first sight so the hellions will now be fighting the Scourges. It was at about this time I was adding some more details to monoliths and I’d painted up some spare bits from the Talos set to use in this way. 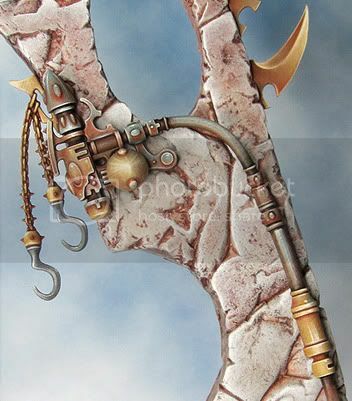 I guess I was a bit relaxed about how I approached the painting and started to experiment with using a brown basecoat and worked up from that using a selection of brown, gold, grey and blue tones. 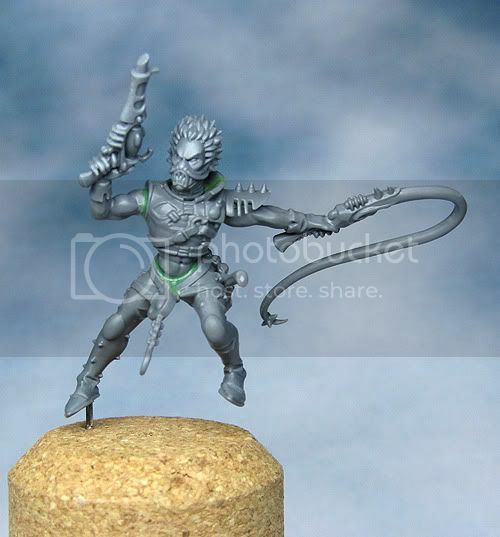 I really like the look of this so I wondered what would happen if I took the same approach to a Dark Eldar mini. Here is the result. I feel that this is a very different approach to colour for me and it has some potential for exploration I particularly like the way it enables me to play with the contrast between warm and cool colours without resorting to 80s style day glow! Getting to the root of the matter & turning over a new leaf. I came across a brilliant tutorial over at bestienmeister.blogspot.com. It’s exactly the sort technique I’ve been looking for to add some more detail and texture to my current diorama project. I ordered some linden leaves by plusmodels and quick trip out to the garden provided some bamboo roots. It needs a few finishing touches and a lick of paint but I’m really pleased with how this is working out. I will be adding a few more leafy vines over the coming weeks as I build up the detail. 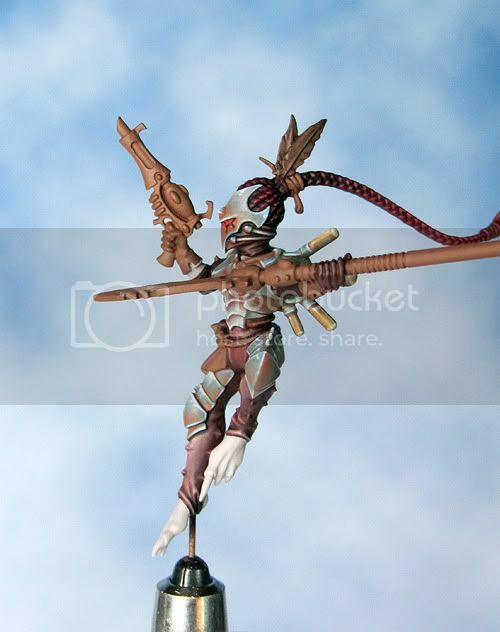 At the same time as I’ve been working on the diorama base I’ve also been painting the Dark Eldar. 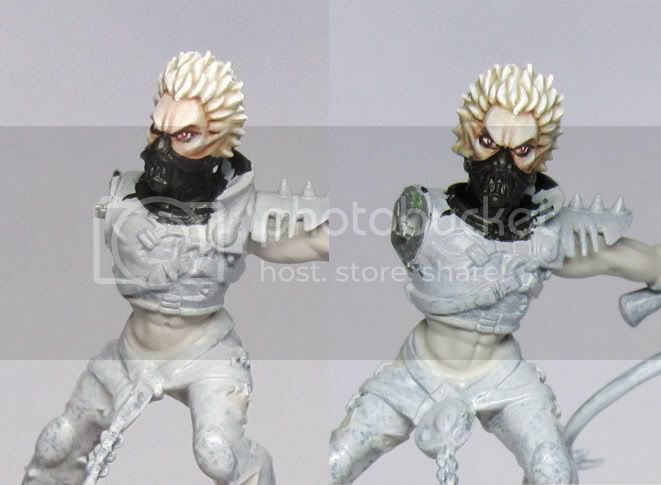 The first of the Hellions is done but I remembered to take a few snaps of the work in progress. 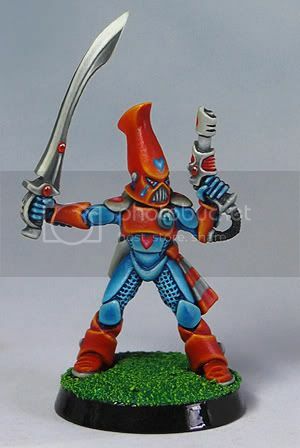 I wanted to try something a bit different from the usual black with neon edges that you see on the Dark Eldar. What I’ve gone for is a strong red/green contrast against a deep blue grey background. To be honest although I’m pleased with the final result I’m not yet convinced that this is right for the diorama. Something else that bugs me is that the colour scheme resembles the sort of thing I was doing in the late 80s and early 90s. Having finished my Dr Who diorama I wanted to set about something a little more ambitious. 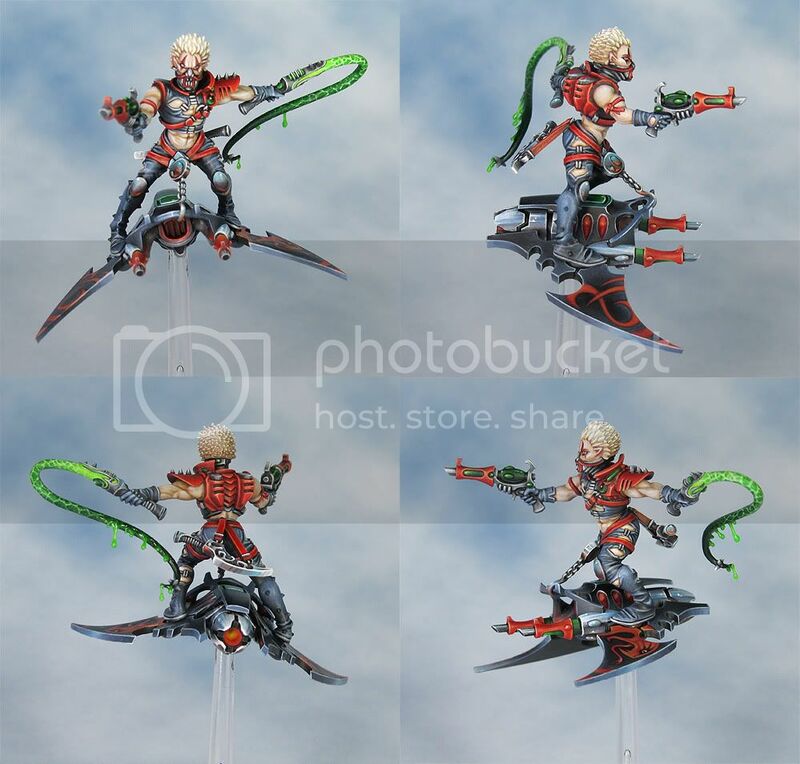 The release of the new Dark Eldar minis from Games workshop caught my imagination. 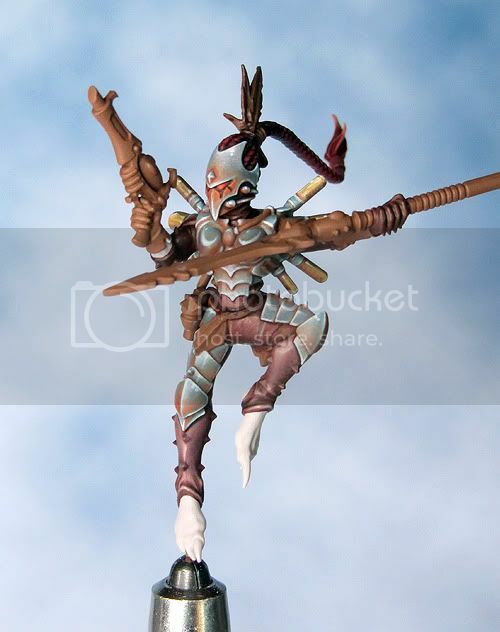 I’ve always had a soft spot for GWs Elves in all their variants. 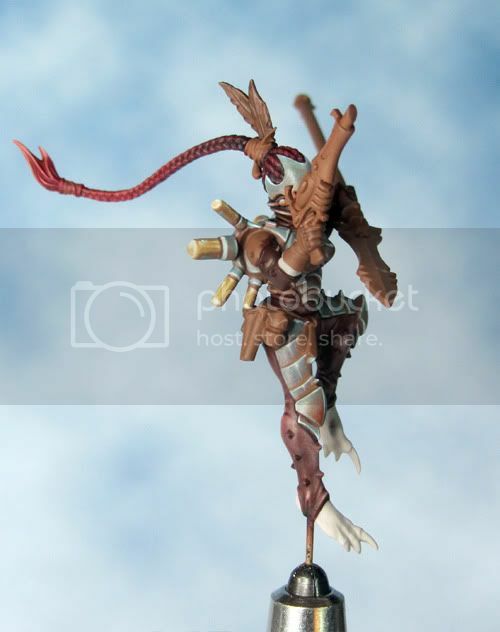 The minis that really got my attention were the Hellions and I began to work upon the notion of building a diorama around an aerial conflict between rival gangs. Here is the base as it currently stands. I wanted the setting to have a sense of history something that would reflect the fall of a great civilisation and the resultant rise of something cruel and barbaric in its place. 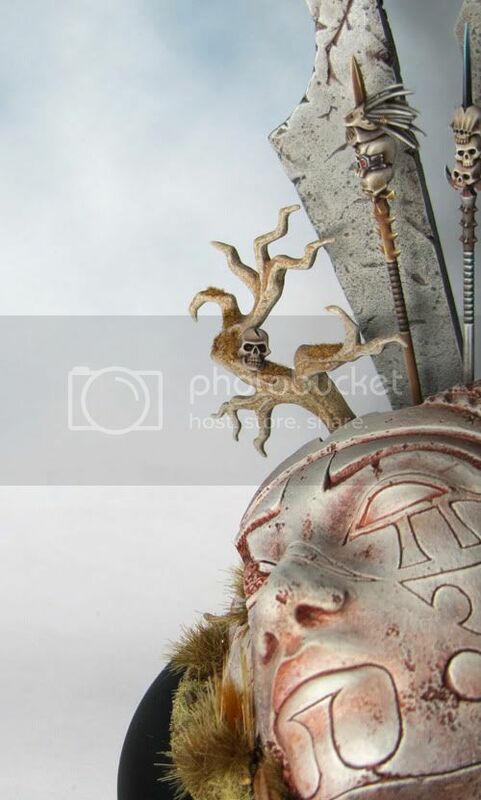 Aggressive Dark eldar monoliths loom over the ruined remains of a colossal Eldar statue. 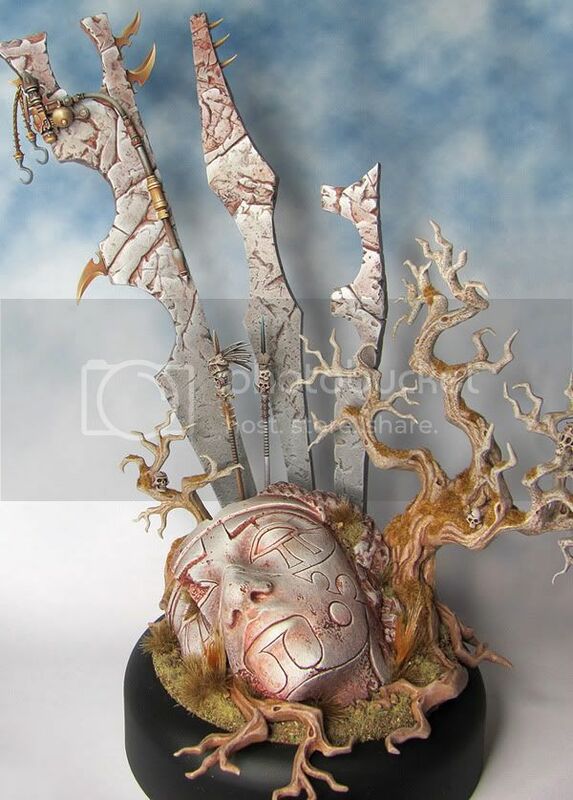 Everything is in a state degeneration and all about are the ghastly trophies and totems of the Dark Eldar. I've included a few views of some details. 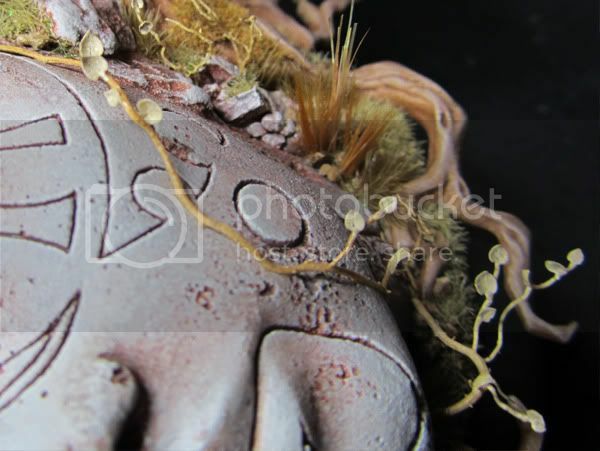 The monoliths are made with super sculpey firm using real stones to stamp some texture into their surfaces. 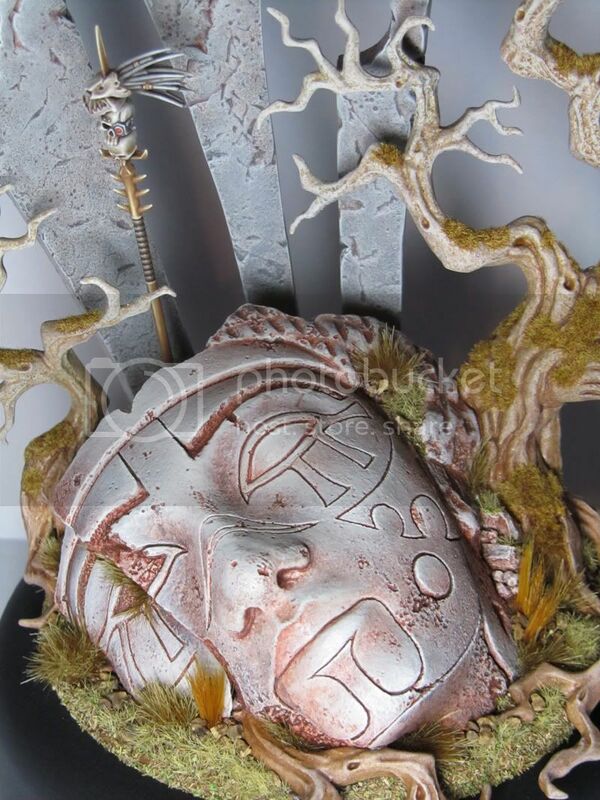 The ruined Eldar statue is made from a plaster cast of an Ancient Egyptian head. 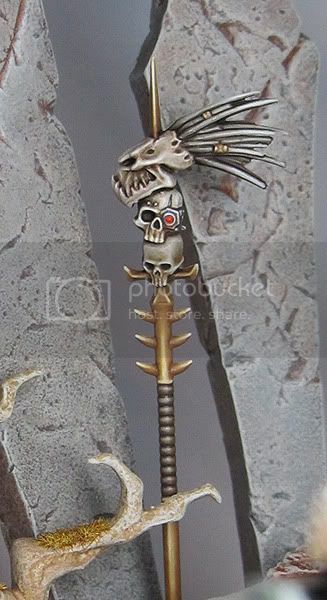 It’s been re carved to give it a suitably Eldar look and then subjected to some distressing to give it a more ruinous look. I intend to add a lot more detail to this base and really build up layers of use, decay, over growth and re-use to create something with a rich visual texture and a feeling of the passing of ages. Into The Woods - the finished diorama. So after many a distraction and a bit of a wait for the angels my diorama is finally finished! The angels are painted very simply with dry brushing to create a stony texture and a little washing to define the shadows. Shifting back down to 28mm scale after all these years was quite a challenge and I had to re-think how I went about things. At the age of 14 I could happily sit on the floor and paint minis all day every day (during the Summer holls at any rate) but at 44 a couple of hours is quite as much as I would want to try without a break. 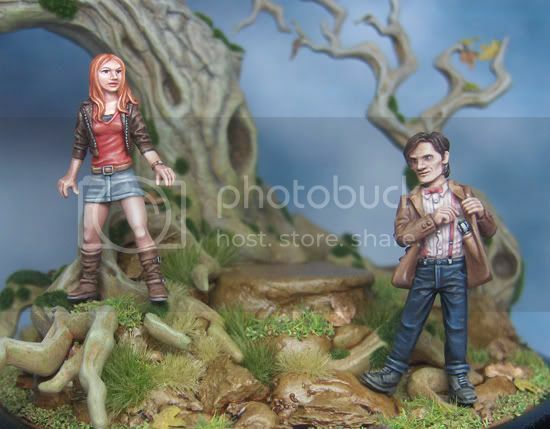 The first test fitting of the Doctor & Amy in situ on the diorama. They are not properly fixed in place as yet, pending the other elements of the overall composition. 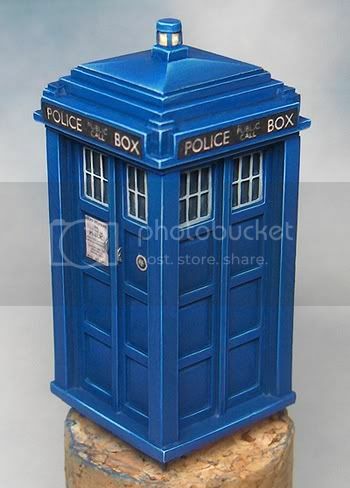 The Police box is finished. I needed to work with a lot of layers of diluted colour to achieve a subtle blend of the blue tones. Keeping the highlighting fine and sharp really helps to pull together the definition. The painting of the base is pretty much finished. There is a lot of dry brushing, colour washed and splattering with an old toothbrush built up in many layers. The really fun bit was sticking on the flock, static grass and scenic details to try and bring the whole thing to life. Once the miniatures are in place I will finish off with some more scenic bits and pieces. The whole thing was built onto a disk of plasticard ready to be set into a resin plinth from Fenris Games. 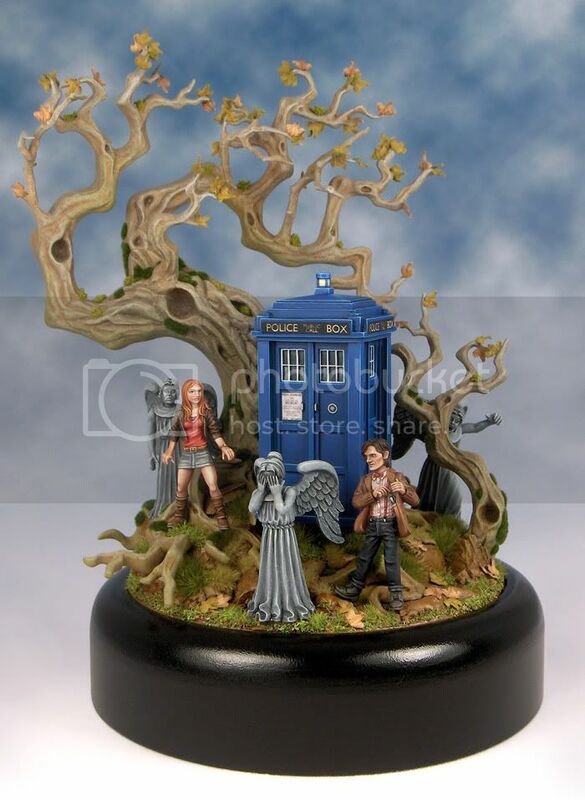 As well as the Doctor, Amy and the Tardis I will have The Crooked Dice Scary Statues creeping up on them from behind. With the main minis for my diorama painted it was high time to turn my attention to their environment. I wanted to get the overall composition planned out at this stage rather than leaving it until all the miniatures were totally finished. My initial ideas were far simpler but things moved on as they always do. 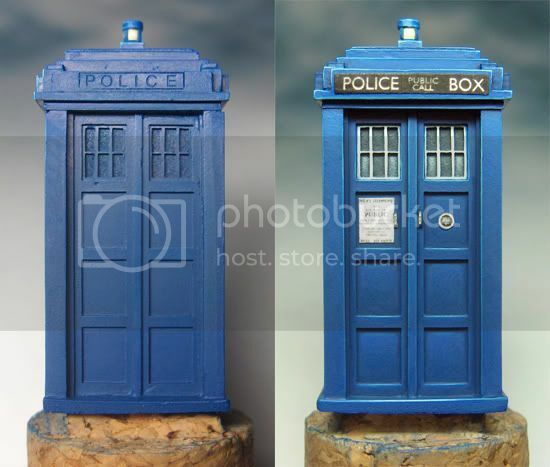 As this is a Dr Who dioroma I really needed a Police Box mini . I chose the Glasgow police box from Fenris Games. 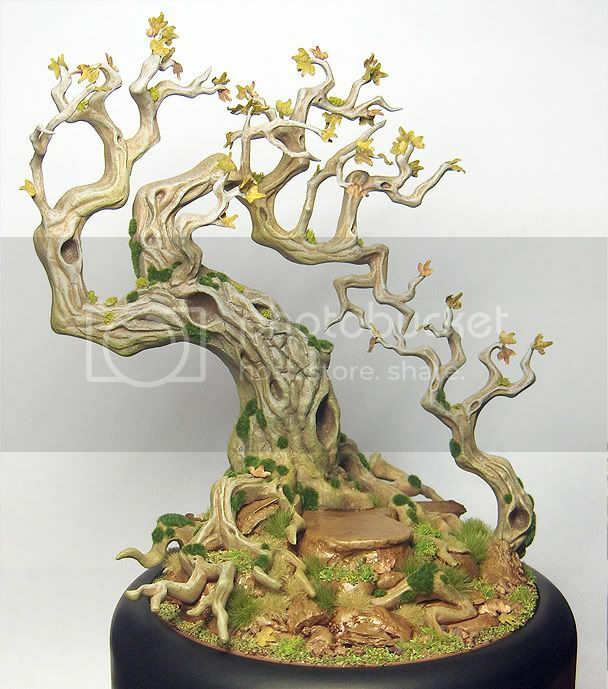 A few stones out of the garden, some sand, a lot of greenstuff and a Games Workshop plastic tree go together to make my diorama base. Everything is assembled and given a base coat. 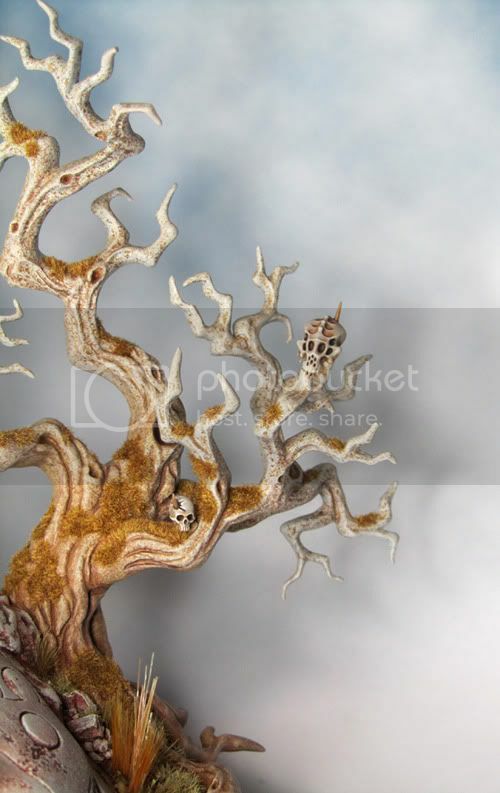 The highly stylised Games Workshop Trees are perfect, as I want the diorama to have something of a fairy tale quality. Here is the finished Emily Lake mini. 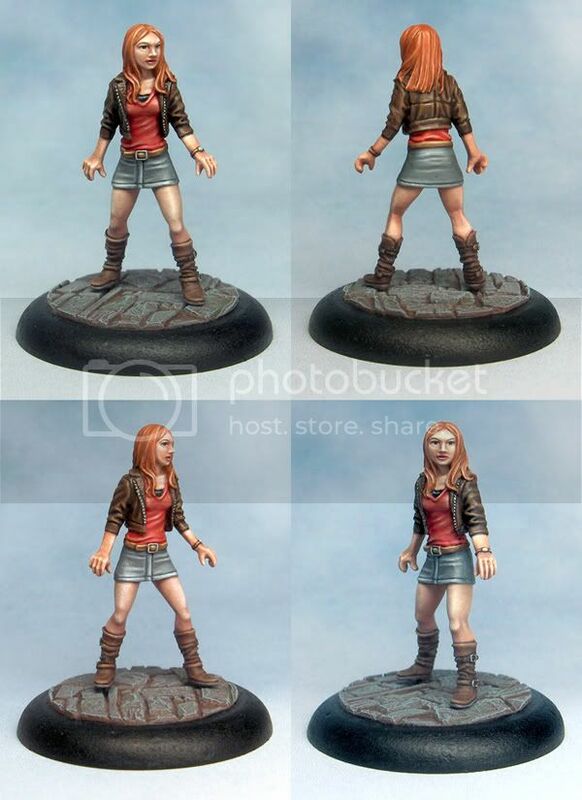 Heresy released Emily Lake a companion figure for the Nerdlord just before I finished painting him. 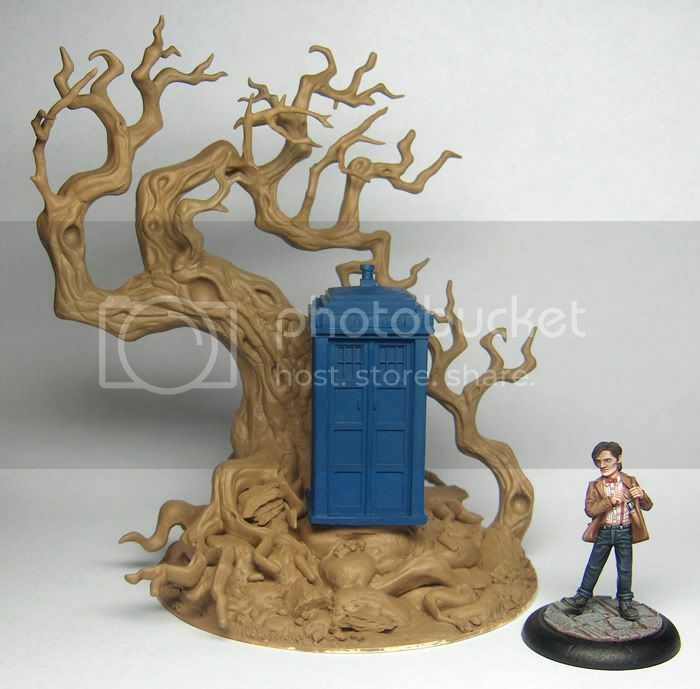 At the same time Crooked Dice have been releasing their own range of 'Dr Whoish' miniatures including a set of Scary Statues. I could feel a diorama coming on! 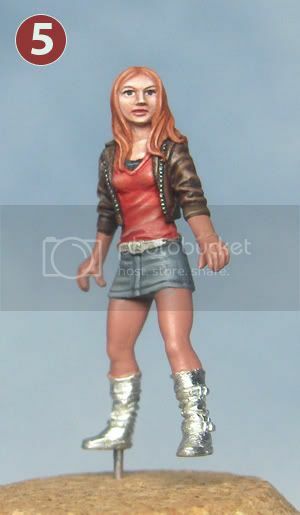 Here are my step by step picture of the Emily Lake mini.